Let your suit do the talking for you. These novelty suits are anything but throwaway costumes. They’re legit three-piece suits—jacket, pants, and a matching tie—in bold, bright patterns that are sure to turn heads. The three friends behind OppoSuits don’t take themselves too seriously, but their suits are serious business. Constructed just like traditional ones, these slim-fitting suits even feature a nicely-lined jacket. You’ll look perfectly pulled together while donning a personality-laden print. Order based on your jacket size, but because you pick one size for the whole shebang, you might need a trip to the tailor for the pants (they can be tailored up or down two whole sizes). Suit up along with friends at a bachelor party, stand out at a wedding, or rock one anywhere you want to make a big impression without saying a word. Hello everyone! I'm proud to introduce Opposuits to The Grommet. I'd be happy to answer any questions you may have! It appears to me that you are being discriminating! 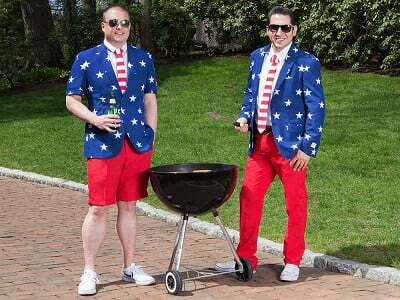 LOL I think one of the jackets would be super fun to have for July 4th FOR LADIES............Neat idea though! Sadly, due to a lack of foresight, this company is losing out on MILLIONS of potential dollars. Not very good business sense, considering that 65% of Americans are overweight or obese. Hi Stu, thanks for the comment! Very cool looking is right. Every company has to start somewhere. While there are not big & tall sizes available at the moment, that doesn't write them off for the future. 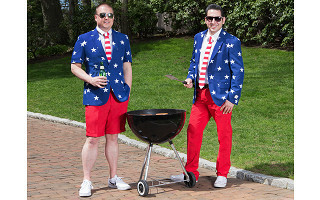 With support on site, OppoSuits can continue to grow and so can their size offerings. As soon as additional sizes are available, we will let you know. @Al That should be six feet tall. Not, not six inches. @Al Al, good news for you! We do have got bigger sizes, but not 'long sizes'. Of course the bigger the sizes are longer than the smaller sizes. To get a good overview of which size you should get, I suggest to take a look here. Love to see these for women!!!! @Joyce Hi Joyce, you are yet another customer who would like to see female suits from OppoSuits. 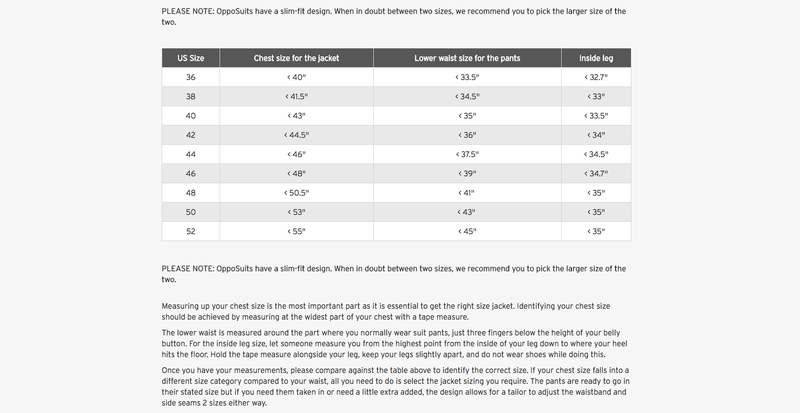 If you take a good look at the sizing chart you can get a suit which will fit you nicely. You wouldn't be the first women to rock OppoSuits. How these suits supposed to be cleaned? Good question! This is NOT some sort of a disposable costume. Our suits are made of high-quality suit fabric as you would expect of any other proper (but boring) suit. You will be positively surprised by the quality. Therefore, the suits will last a long time enabling you to wear it plenty of times which is probably needed assuming you like to have a good time. You can clean the suits by just putting them in the washing machine! Might be a silly question, but does the summer suit got very hot in the summer or does it hold up well in the heat? Hi Wallace, it will be a little heavy, but if you're going to commit to it, heat will not be an issue. These are really cute. I'm a woman, 5'2 could I fit in your smallest size? Thanks, Linh! It will all come down to your jacket size. If you can fit in a size 36 jacket, you're good to go. The pants need to be tailored anyway. Let your suit do the talking for you. These novelty suits are anything but throwaway costumes. They’re legit three-piece suits—jacket, pants, and a matching tie—in bold, bright patterns that are sure to turn heads. 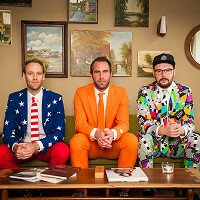 The three friends behind OppoSuits don’t take themselves too seriously, but their suits are serious business. Constructed just like traditional ones, these slim-fitting suits even feature a nicely-lined jacket. You’ll look perfectly pulled together while donning a personality-laden print. Order based on your jacket size, but because you pick one size for the whole shebang, you might need a trip to the tailor for the pants (they can be tailored up or down two whole sizes).